The first time I came to the MediaTek office I got myself lost in the maze of giant buildings outside and had to follow the road signs to find where I wanted to go. MediaTek’s summer internship gave me a wealth of training and experience to take into my everyday life as well as the opportunity to apply things I had learnt at school to real-life challenges as I tried to solve engineering problems with my mentor and colleagues. I am extremely grateful to my mentor for taking time out of their busy work day to guide me with patience and to help me find the resources to solve my problems. The workshops with other interns helped us grow closer, and hearing the other interns talk about the happenings in their working lives in different departments let me learn a lot from the strengths of my fellow interns at MediaTek. 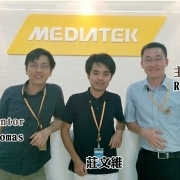 But hearing about the first-class, complete and varied assistance, guidance, and leisure opportunities provided to colleagues by MediaTek completely changed my impression of how MediaTek and other companies in this industry treat their employees. Wen-Wei - MediaTek HQ, Hsinchu, Taiwan.